No cat’s day is complete without a pinch of Yeowww! Organic Catnip. This isn’t just any catnip — it comes from farmers that harvest the best organically grown catnip around. 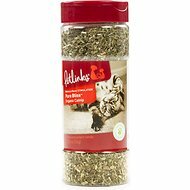 This high-quality signature blend contains just leaves and flower tops for the most effective catnip. It’s superior to your everyday catnip in terms of freshness, color and aroma. No chemicals or pesticides are used in cultivation, which means Yeowww! catnip is completely safe for cats and humans. Sprinkle a little on your kitty’s favorite scratcher or use it to stuff your own handmade toys. See all items by Yeowww! At five years and thirteen years old, my pets don't often express many moments of ecstatic joy and energy. Once I opened this catnip,...well, let's just say that for a few moments I had to stand in amazement, and watch the show. This is a very good mood elevator for older and moody pets. And,...EVERY time I open the tub, the aroma waffs through the air and my cats perk up immediately. Try it. You'll like it. my review is not about the product but about the way it arrived, the outside box was fine, it was delivered super quick , but the catnip had been jammed into the box and it cracked in two places, which spread catnip inside the box. please be more careful when you pack a delicate thin walled plastic container in with heavy cases of canned cat food...maybe put it into its own little box inside the bigger one? This stuff is da best! Meow Meow & his friend, Butter Pumkin' Buster absolutely love Yeowww! catnip, they can't get enough. Meow Meow is quite content to roll in it and play whilst Butter greedily and happily purr growls and loves to eat it! Man, do they have a ball afterwards ruling the neighborhood! Just a couple of cool kitties lording Ocean Beach, SD and loving their lives as they were both abandoned kittens and now living a truly happy life! Great product & the best catnip on the market and better than I have grown in our yard. They were not excited about toys that have the catnip in it but they love this. I can sprinkle it on a toy that I have on a wand and they go wild jumping for it. I also have some mice that I can put fresh catnip in and they like those. They even like to eat it. This catnip is seriously amazing. It gets my 6 kitties sooo excited, they can't wait to play! I sprinkle it on their toys and inside their toy boxes and watch them have a Catnip Pawty! A little advice to pet parents who feel like they can't sleep because whiskers wants to play at bedtime... Give them catnip before you go to bed. They will play hard then pass out into kitty zen. Trust me. Cats love it and we like it because there are no sticks or other pieces of the plant that feel sharp. Some catnip can stick to my fingers like a sliver. So I have to pick through it before I give it to the cats. Not with this brand! We'll buy this again! 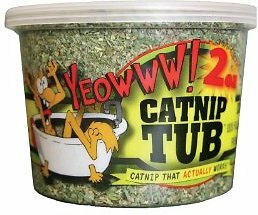 When this product originally came out, the cats would go crazy for it and it was amazing, but now, I opened the tub I ordered and it doesn't smell at all, my cat has no interest for it. She does love other brands, this is the first time that she doesn't like a catnip. My cats goes cray cray for this catnip. 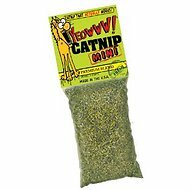 I purchased in store catnip before and never have the same effect my cats has when I used this brand. Even one of the cat that never care for catnip seem interested in this. You get a good amount from the tub. The first tub lasted me about 4months and that's using it every other day. Great product. Quick tip; it does do better when you squeeze it between your fingers before spreading it around. It create a better scent for them to enjoy. I love using this to lure my cats to different toys or cat houses. The cats were all happy with this catnip. It smells fresh to me, and very condensed,so they are actually getting quite a bit of a treat with just a tablespoon or so in a bowl (they like to eat it). If it were Summer, I would let them spread some around to lay in like they also like to do with catnip. This stuff is really good! My cats love it! I have been trying everything to get them to use scratch post & pads instead of furniture! This finally did the trick! They run over to scratch and prune their nails & get rewarded with a "hit" of their "weed". Then they are very happy!